Wickhambrook Methodist Church is in the Ely and Newmarket Methodist Circuit and part of the East Anglia District. Our Senior Steward is Ivan Peacock who lives in Wickhambrook. The Minister organises local preachers to take most of our services and we have a rota system where every other month or so, all the churches within our circuit can all join together for worship. The Methodist Church has a main Church with a foyer and gallery. 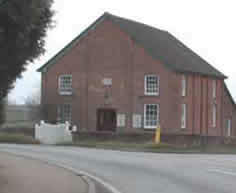 Adjacent is the school room which in days gone by was use for Sunday School – unfortunately this is no longer operating. The school room is available as a function room should anyone wish to use it. It has a kitchen facility and toilets. We have services every Sunday at 10.30am. Family Worship is on the last Sunday in each month, followed by a coffee and a chat. A meeting for ladies of all ages Harmony Hour meets on alternate Tuesdays at 2.30pm. Our services usually have four to five hymns, Bible readings, prayers and a sermon. We always have, once a month after family service, tea and coffee and time for a chat afterwards. Our services are warm and friendly and the social gatherings afterwards are an important time for us. At special times during the Christian calendar we have services where we join together with the Wickhambrook United Reformed Church. We also have ‘get together’ evenings where we meet up with others from the surrounding villages within our own Methodist Church circuit and have a 5pm service followed by a 6pm tea. We are also a member of the Churches Together in Wickhambrook and District. Ladies Harmony Hour fortnightly at 2pm.